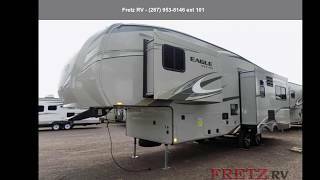 Hi, I am interested in your 2019 JAYCO Eagle (stock #14259) listed on Autotrader for $35,888. I'd like to get more information about this vehicle and confirm its availability. This Eagle HTX 27SGX fifth wheel by Jayco offers a rear living area and triple slide outs.As you enter model 27SGX to the left there is a slide out with an entertainment center with an option to add a fireplace below, and a free standing table & chairs. The rear living area has two recliners. The roadside slide out offers a tri-fold sofa or you can choose an optional L-dinette, with an overhead cabinet, a refrigerator, and a three burner range with a microwave above. Along the interior wall in the kitchen/living area, there is plenty of counter space, a double kitchen sink, as well as overhead cabinets for your dishes.The bathroom is at the top of the stairs on the left. Inside the bathroom, there is a sink, medicine cabinet, corner shower, toilet, and linen cabinet. The bathroom has a private entrance into the bedroom. The linen cabinet is part of the bedroom slide.The bedroom offers a slide out with a wardrobe, dresser, and linen cabinet. There is also a comfortable queen bed and wardrobes on either side of the bed including nightstands and shelves.You will find plenty of overhead cabinets throughout the 27SGX as well as exterior storage, a 14 awning, plus much more! Fretz RV is a top dealer for all 2018, 2019, and 2020 Jayco trailers in the Philadelphia, Pennsylvania, Delaware, Maryland, New Jersey and New York Areas. These campers come in as Travel Trailers, Fifth 5thWheels, Toy Haulers, Pop Ups, Hybrids, Tear Drops, and Folding Campers. Brand Names Hummingbirds, Jay Series Sport Camping Trailers, Jay Feather, White Hawk, Jay Flight, SLX, Bungalows, Eagle HT, Eagle, North Point, Pinnacle, Designer, Octane, SL, Talon, Seismic, and Wave. They are in the top of their class. RV floorplans come with anywhere between zero and 5 slides. Most can be pulled with a ton truck, SUV or Minivan. If you are not sure if you can tow certain weights, you can contact us or you can get tow ratings from Trailer Life towing guide. We also carry used and Certified Pre-owned RVs like Forest River, Mobile Suites, DRV, Redwood, T@B, Dutchmen, Keystone, KZ, Grand Design, Casita, Scamp, Cougar, Montana, Raptor, Springdale, Passport, Salem, Catalina, Coachmen and Airstream, and are always below NADA values. We take all types of trades. When it comes to RVs, we are your full service stop. With over 73 years in business, we have built an excellent reputation in the RV industry to our customers as well as our suppliers and manufacturers. At Fretz RV we have a 12,000 Sq. Ft showroom, a huge RV Parts and Accessories store. We added a 30,000 square foot Indoor Service Facility that opened in Spring of 2018. We have full RV Service and Repair with RVIA Certified Technicians. Bank financing is available for RV loans with a wide variety of RV lenders ready to earn your business. It doesnt matter what state you are from, we have lenders that cover those areas. We also have RV Insurance, RV Warranties, and RV Rental information available. We have detailed videos on RV Trader, RVT, Classified Ads, eBay, and Youtube. Like us on Facebook Check out our great Google and Dealer Rater reviews at Fretz RV. We are located at 3479 Bethlehem Pike, Souderton, PA 18964 215-723-3121. Start Camping now and see the world. We pass RV savings direct to you. Call for details! Price does not include Taxes, Tag, DOC Fee, Destination, Freight, or Prep. Call for details.